Over at AnceStories2: Stories of Me for My Descendants, I wrote some writing prompts about New Year's Eve and Day memories. Here are mine. *Do you remember the first time you were allowed to stay up and see in the New Year? How old were you? The first time I actually remember staying up to see in the New Year must have been New Year's Eve 1978, which was spent in Grand Rapids, Michigan. Our family had flown from our home in Southeast Alaska to Western Michigan to spend a month with extended family members during the holidays. We were at my mother's parents, Grandpa and Grandma DeVries. We probably watched the festivities in Times Square on television, and then as the New Year was rung in, we spent some time in prayer for our nation and the world, and then wished each other a Happy New Year before going off to bed. I'm sure my little brother, who was 4 years old, was asleep, and probably my 2-month-old sister. I was 11 1/2. *How did you and your typically spend New Year's Eve during your youth? Did you go to a Watch Night Service and participate in communion and prayer? Did you watch the ball drop in Times Square on television? Did your community have a fireworks show? From earlier times in my childhood, I remember going to church on New Year's Eve, but not as late as midnight, of course. It was an evening service and usually there was prayer and communion. We didn't watch television, because we didn't have television service on Prince of Wales Island in Alaska. There weren't any fireworks, either! *Did you have first-footers, mummers, or bang pots and pans on your front porch? Did you wear party hats and use noisemakers? I don't ever remember any special celebrations at home when I was girl, probably because I was too young to stay up so late. We lived in an isolated area, also. *If New Year's Eve involved feasting of some kind, what were the usual fare and beverages? Because there weren't any kind of celebrations, that kind of nixed feasting, too. *How do all of the above compare to the way you celebrate New Year's Eve now? Since our kids have been old enough to stay up and see in the New Year, we usually have snacks and sodas (and rum and cokes for the adults). We'll often rent a favorite movie, then check in with the replay of Times Square shortly before midnight. We have party hats, rattles, and party horns that we take with us out on the front porch and wish the world a "Happy New Year!" Most of the neighbors do the same thing: a quiet party at home with noisy celebration in the front yards at midnight. From our front porch, we can see the fireworks downtown two miles away. I do like to invite our across-the-street neighbor (a friend we've had for over 20 years who we encouraged to move into our neighborhood about 10 years ago) to cross our threshold soon after midnight. He's a dark-haired Scot, and that's supposed to be a symbol of good luck! *What about New Year's Resolutions? Did you make any when you were younger? Do you make them now? How well do you keep them? Was there any year when you really did a fabulous job at keeping them? What were your goals and how did you keep them? *How did you typically spend New Year's Day in your childhood and youth? Did you visit family and friends? Did your family host an Open House? Did you watch the Tournament of Roses Parade and Rose Bowl game or another favorite sport? Or did you go to your favorite ski resort? 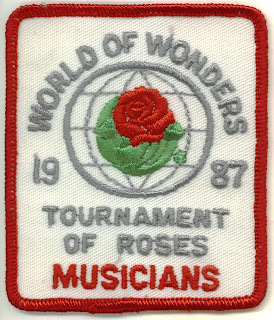 I don't remember any particular New Year's Day before 1979, when I watched the Tournament of Roses parade for the first time at my Grandparent DeVries' home. I never would have suspected that eight years later, I would march in that parade myself! When I was in college, I spent several New Year's Days skiing at 49* North. Gosh, just thinking of it makes me realize how much I miss skiing! My daughter went snowboarding a week or so ago for the first time, and she she told me about wearing a helmet. I kind of chuckled when she told me because in my day, we never wore helmets (it's much safer now, I'm sure). *How does it compare to the way you spend New Year's Day now? Now, I'm more likely to be taking down the Christmas tree and packing things up. When the kids were younger (and being homeschooled), we used to get together with some family friends that had children close to our own children's age. The kids would go sledding at a nearby park with the dads and we moms would sit and visit while watching the littlest ones. *Are there any special customs from your heritage that are integrated into your New Year's celebrations? The closest thing would be having a First-footer: a dark-haired Scot being the first to cross your threshold in the New Year bringing good luck. *If you celebrate Christmas or another seasonal holiday before the New Year, when do you take down the decorations and put them away? Depending upon whether we have plans for New Year's Day, I try to get the decorations down on the 1st or 2nd of the month. This year, it took me much longer, simply because doing everything takes a little longer with my healing shoulder. I was encouraged, however, noting the difference between how immobile my shoulder and arm had been when putting up the decorations five weeks earlier compared with how much improved it had become. Who Are You? A CROTHERS Family Member?